Built in 1824, it was the first Baptist Church to be constructed in St. Mary. The Church was among those supporters of the Colonial Church Union. It was, however, rebuilt in 1835 with funds collected by William Knibb and Thomas Buxton who were renowned abolitionists. 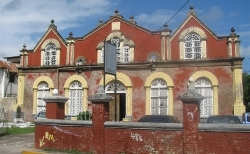 The building stands on the seaward side of the main road leading from Annotto Bay to Port Antonio just beyond the Annotto Bay Police Station. The Church itself is of a single rectangular plan form with a pitch roof. All the doors and windows have pilasters, architraves and surrounds executed in plaster, in which various decorative motifs have been cut. A similar cut plaster bend adorns the interior and exterior walls at cornice height and is inscribed with biblical quotations and other exhortations relating to goodness.